Stamp collecting is an extremely popular and diversified hobby with around 60 million collectors. 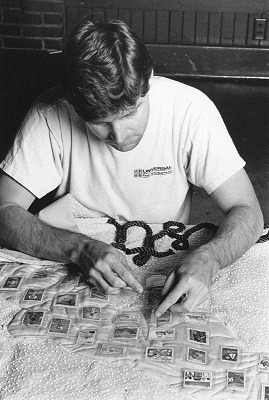 Approximately 5 million people in the United States are stamp collectors. The hobby is also very popular in Great Britain, China, India, and Singapore. It is estimated that China alone has one-third of the world’s collectors. Ever since the first stamp, the Penny Black, was issued in the Great Britain in 1840, people have been captivated the beauty, artistry, and the historical, cultural, political and economic significance of stamps. Some famous stamp collectors include President Franklin Delano Roosevelt, King George V, Charlie Chaplin, John Lennon, and Amelia Earhart. A stamp collection can be started on any budget. One can start a free collection by simply saving the stamps on letters one receives in the mail. 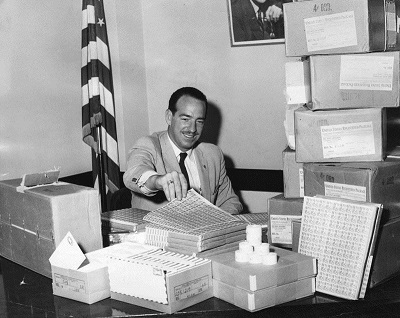 Collections can be organized by topic, country, region, era, notable people, or type such as commemorative, airmail, war tax stamps, and many others. Some purchase stamps as an investment. Recently, an 1856 British Guiana 1-cent Magenta sold at a Sotheby’s auction for $9.48 million. The oldest stamp collection on record was started by John Bourke in 1774 and now belongs to the Royal Irish Academy. “A Hobby for Everyone.” American Philatelic Society. Chow, Jason (September 24, 2013). “China Goes Postal for Stamp Collecting.” Wall Street Journal. “Famous Stamp Collectors.” Smithsonian National Postal Museum. Lawrence, Ken (December, 2009). ‘The Oldest Stamp Collection: A Sequel.” Scott Stamp Monthly. For stamp enthusiasts, the Business & Economics Department has a number of key resources. Whether you are new to the hobby or you are a veteran collector, the library has materials that will aid in your stamp research. Catalogue of Errors on US Postage Stamps. The Official 2014 Blackbook Price Guide of United States Postage Stamps. The Postal Service Guide to U.S. Stamps. Linn’s Stamp News (merged with Scott Stamp Monthly in late 2010): Essential weekly periodical covering stamp news, historical information, tips on collecting, trends, and advertisements for stamp collecting materials. We also have back issues of Scott Stamp Monthly. Guide to Stamp Collecting by Janet Klug. U.S. Domestic Postal Rates, 1872-1999 by Henry W. Beecher. Linn’s Stamp News: Current stamp news, lots of free “how to” and reference aid for stamps collectors.